This is an obligatory post. How could I possibly let an August in the Northeast go by without commenting on tomatoes? No, not beefsteak tomatoes. Are you crazy? I mean heirloom tomatoes. Vine-ripened heirloom tomatoes from a farm stand, or an urban greenmarket, or a friend’s garden on Long Island. 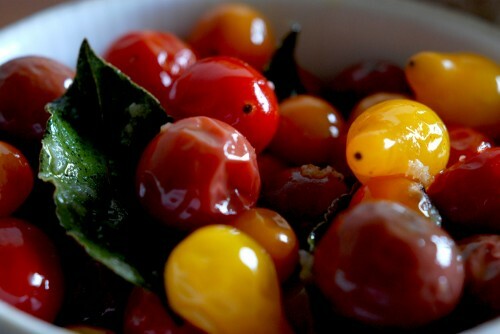 Or, wait, better yet, heirloom cherry tomatoes from a friend’s rooftop garden in Brooklyn. 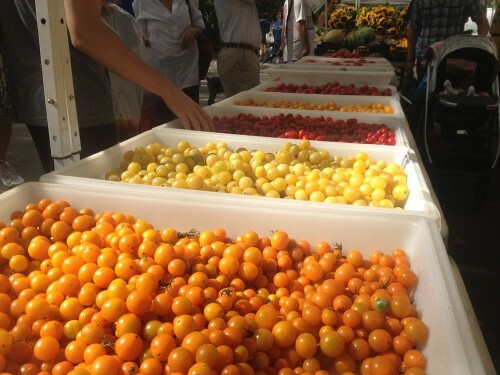 Yes, that’s it: vine-ripened-heirloom-hipster-miniature-multicolored-multishaped tomatoes. Oh, I feel so with it! And I feel so wistful. As I sit here and figure out why the mixed feelings, I’m the first to admit I love heirloom tomatoes, for their flavor, for their whimsy, for how their ascent in popularity flouts the imperative of uniformity that defines industrial agriculture. I love that their riot of color, festooned only with olive oil, salt, pepper, and basil, is all the decoration a table needs. I love the fact that seeds for these funny-looking beauts are sometimes sold out, and love that it reveals how enthusiastically we want to feed ourselves, and with what. Minus the failed harvests and primitive dentistry, I too yearn for a Jeffersonian kind of world where everyone has space and time to grow food, and saving seeds doesn’t invite a battle against a multinational in federal court. Something, however, got co-opted during our turnabout to artisinal eating. I live on an island where, apart from some fast food that’s infiltrated the diet, and the urban Balinese psyche’s misguided reach for cachet, artisanal eating is pretty much all there is, so why the fuss? No one in Bali cooks snails or bee larvae or wild fiddle ferns or banana flowers while carrying on about their provenance. It’s just food, and if the cook is skilled all the better. There’s nothing self-conscious about cooking and eating. Even when I was growing up (longer ago than I care to reveal) with a mother who procured wild salad greens when my friends were eating iceberg, there was nothing self-conscious about it. Things to be self-conscious about were pretty tried and true: your pimples, for example. Your outfit. Your address. Even your cooking skills, maybe. But it certainly wasn’t the savvy with which you did, or god forbid, did not, stock your larder. I wonder what Jefferson would think of all this, of our expensive farmers’ markets, of blogs and glossies enshrining food, of waiters and menus that gush about the process of procuring and preparing our meals (a particular Miami-Beach narrative my husband and I endured about a long-line-caught tuna still echoes in my mind), or pared down menus that grunt in nouns, implying the chef knows that you know that he knows what he’s doing. I do happen to know, that’s my job, but what if I didn’t? How would the cardoons and lardons on that menu make me feel? Thanks to chef Andrew Matthews for the best tomato recipe I know. More of Andrew’s vegetable magic will appear in the future, I promise. HERE’S WHAT TO DO: I like to prepare these in an iron skillet, which conducts heat over a pilot light on a stove. Since the key to these tomatoes is to get them just warm enough to marinate without splitting the skins, you may need to experiment with your own equipment. When I have no pilot light and do these in a slow oven, I prefer to use a ceramic or pyrex dish. Place all the ingredients in a skillet or casserole. Gently coat the tomatoes evenly with the oil and seasonings. Allow to rest in a warm part of your kitchen, or in a very slow oven (about 120ºF / 50ºC), until the tomatoes are soft and sweet. I most recently let the iron skillet rest over the pilot light of my stove for a full 12 hours. 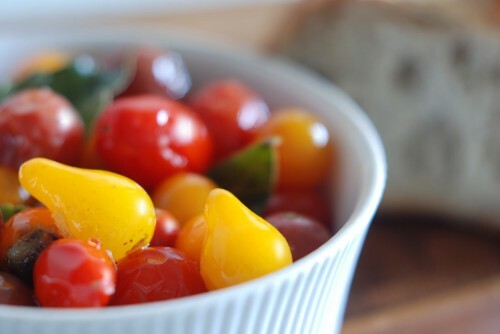 Using a slotted spoon, remove the tomatoes to a bowl and store in the refrigerator. Reserve the oil for seasoning anything and everything. Well maybe not ice cream, but you know what I mean. THANK YOU. Right on… it’s enough to make you just want to hole up and cook quietly, on your own, minding your own business. And NOT blog about it. So thanks. ~ Jorin Hawley, August 23, 2012 at 6:29 am. Tomato & herb infused ice cream — aaaaahhhh the gluttony.!!!! ~ Andre du Perignac, August 28, 2012 at 11:20 pm. I love tomatoes and this recipe is just awesome. ~ Christian Rene Friborg, November 26, 2012 at 12:42 pm.